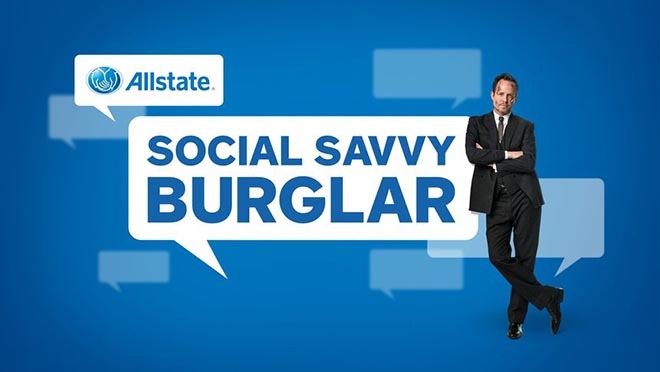 Allstate’s Social Savvy Burglar campaign, developed at Leo Burnett Chicago, has won the Integration Grand Prix at the London International Awards. People love using social media to tell the world where they are. But in the wrong hands, this information could be dangerous. 78% of burglars now use social media to find their targets. Allstate wanted to raise awareness of this modern insurance vulnerability. On January 1, 2015, Allstate and Leo Burnett made an example of one real oversharing couple during a highly-anticipated game of American college football. 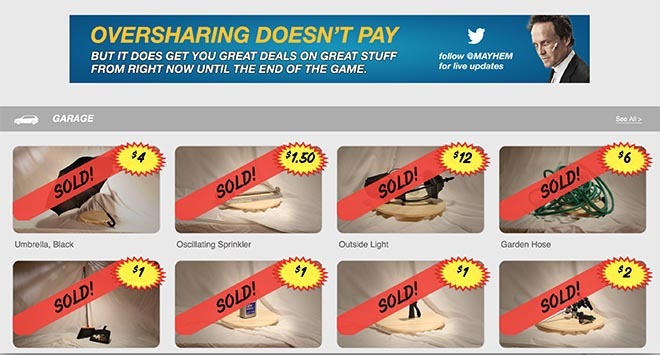 Shortly after kickoff, a social media-savvy burglar appeared in their home and started selling everything. 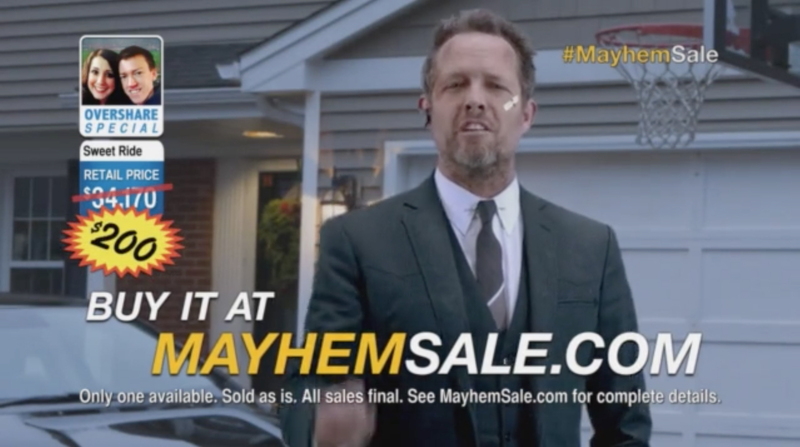 The event unfolded in real time, integrating TV commercials, a synchronised stream of social content, and an e-commerce site, mayhemsale.com, where the burglar sold nearly 300 household items at rock-bottom prices. The message was received. During the game, #MayhemSale was Twitter’s top trending topic worldwide. And the dangers of oversharing became national news. 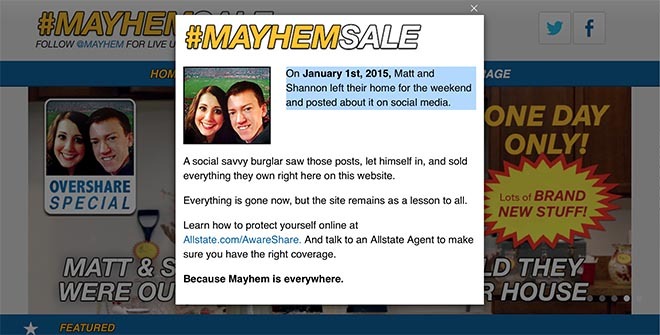 The Allstate Social Savvy Burglar campaign was developed at Leo Burnett Chicago by global chief creative officer Mark Tutssel, chief creative officer Susan Credle, executive creative director Charley Wickman, creative directors Britt Nolan and Mikal Pittman, interactive creative director Nuno Ferreira, associate creative director/copywriter Brandan Jenkins, associate creative director/art director John Regan, copywriters Jake Reilly, Jim Bernardin and Mark Wegwerth, art directors Derek Heinze, Adam Prewozniak, Lauren Wetula and Christopher Cole, agency producers Veronica Puc and Stephen Clark, director of digital strategy Chris Bridgland, digital designer Brett Glover, community manager Daniel Craig, account director David Brot and account executive Alex Coontz working with Allstate marketing manager Pam Hollander. Filming was shot by director Jeff Tremaine via HeLo. Editor was Conor O’Neill at Exile. Sound was designed by John Binder at Another Country. Visual effects were produced at The Mill by VFX producer Erica Hilbert. Digital production was by WeLikeSmall.